Welcome to the New Glarus Bakery! Located in southern Wisconsin, our heritage of making the finest of Swiss and American pastries reaches back to 1910. Under new ownership in 2004, we have continued the time honored tradition of making the same authentic pastries that you have come to know and love. By using our Old World recipes and the highest quality ingredients, we offer you one-of-a-kind breads, pastries, cookies and specialty desserts. On our website, are some of the most popular items that you can enjoy right in your own home. You are certain to find something to treat your taste buds. From the hard-crusted Hearth Breads to the Ethnic Cookie assortment, our traditional ways are sure to please. Whenever you need to take a break from your busy modern-day world, sit back and enjoy a delicacy straight from America’s Little Switzerland. For over 150 years, the beautiful little community of New Glarus, Wisconsin, has been a magnet for Swiss settlers. New Glarus was originally settled by a hardy band of 108 Swiss pioneers in 1845 who left the Canton of Glarus in Switzerland during an economic crisis. Since then, succeeding generations and a steady stream of new Swiss immigrants have kept alive the community’s Swiss-German language, folk traditions, and music. This remarkable mix of old and new Swiss in New Glarus – plus an enduring dedication to preserving ties with the homeland has made this little town a unique place to live, work, and visit. Every year, thousands of visitors, including hundreds of Swiss tourists, are drawn to New Glarus to enjoy the atmosphere that thrives here and nowhere else outside of Switzerland. With small town friendliness and enthusiasm, New Glarus is proud to share its Swiss heritage, its chalet-style architecture, its two fine museums, its famous ethnic festivals, and a wealth of specialty shops and restaurants serving savory Swiss food. New Glarus is also the starting point for the 23-mile long Sugar River Bike Trail, and New Glarus Woods State Park is less than a mile from the edge of the village. So whether your tastes run to shopping all day, polka-ing all night, hiking, biking, golfing, or paying a visit to lovingly maintained local museums you’ll find plenty to do in New Glarus. 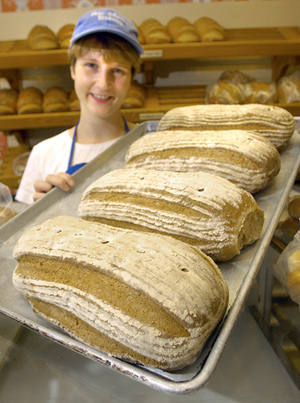 Visit the official “Little Switzerland” website (www.SwissTown.com) to learn more about where New Glarus Bakery is proud to call home.